Shaun Lyndon-Smith has been hairdressing for over 40 years and has worked all over the south coast and overseas. Twenty One years ago, he opened Crowns in Eastgate Square and after a couple of salon name changes and a move to a larger shop, he and his wife Diane, ran the salon formerly known as HQHair. However not long ago, they decided to move away from being part of a franchise, so that they could enjoy the independence that came with it and that chance has now come, with the new name of Hair At No4, at Eastgate Square. Shaun said:” By becoming independent, we can decide on the over-all look and feel of the salon, we can tailor make our staff training to be more specific to our team as opposed to a corporate ‘one-size fits all’ training. Day to day decisions can be made more effectively and quicker, without having to go through the whole corporate process”. Hair At No4 is open 6 days a week (Monday to Saturday) and its opening day will be July 4th -American Independence Day, anyone who wants to pop in, say hi and to have a look is more than welcome throughout the week. Diane said “We hope our team and existing loyal customers will enjoy their new environment and we also look forward to welcoming new faces. We are also looking to recruit some new members to our team. With their new independence, the team at Hair At No4 have also branched out to support a local dementia care charity in Tangmere, by donating salon furniture and offering their services to help out where they can. 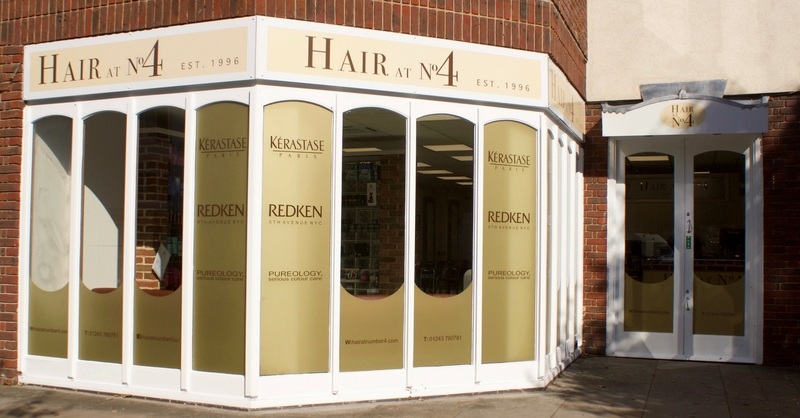 If you would like to find out more about Hair At No4, or to book an appointment, you can get in touch with the team today by calling 01243 780781.